I don’t know about you but the warm weather this fall and the early part of winter is beginning to cause a concern. It makes me think about global warming or the other truth that the ocean floor is heating up. But it all being the same this winter is starting off as a warm and dry season. I was a rancher back in the 80′s and it was a constant concern. Were the rains coming or was the frost going to kill the hay or was the price of cattle going to be up or down when we went to market. Ranching was a continual gamble, it was one thing or another that always came in the way of prosperity. But I must say the largest thing that always got in the way of prosperity was attitude. It has taken me a long time to really understand that the universe simply hears your inner intention and gives it back to you. Life is really a mirror; if you want to see your intentions just take a look at your surroundings. There were plenty of farmers and ranchers that were next to my land, they got the same rain, the same sun and the same frost. But year in a year out they seemed to do better than us. They had newer cars, nicer houses and even had the money to go on vacations. They seemed to always be on top. I knew I worked harder than most; I worked smarter than most but at the end of the year I still had old farm equipment and they were farming with new faster equipment. While I was farming I always wanted to get ahead enough to have the new equipment so I would not break down so much. You see every time the equipment broke down we would spend the day going to town to get parts and repairing the machine. While the others were finishing up their season of harvest we were just getting 50% in the bin. Now if “what you see is what you get” it becomes obvious I was always seeing broken down equipment and I always got it. I was seeing old equipment and I always had it. And I saw myself needing to work harder than others to succeed and boy I also got a lot of working harder. So I ask you? Is the weather warmer because of some outside force controlling our planet or in fact have we been educated through the media that the earth is going to be warmer so in turn our intention is creating such an outcome. I have to tell you a good farming story around intention and the power of prayer. It was quite common that in the fall during harvesting wheat that thunder clouds would form and when they did we would look for the white streaks under the rain cloud in the rain that would indicate hail. Now when the hail storm would come through a ripe ready to harvest field of wheat it could be devastating enough that not even one head of wheat would be standing where the storm was the worst. Well such a storm happened, and as it came across the valley you could see it for miles. We had not started to harvest the field that the storm was headed towards but early the next morning I drove to that field and found the crop had been laid down for almost 70% of the field. But right down the fence line the storm had turned and completely missed our neighbor’s field. It was a few days later before I saw my neighbor and when I did he told me how he held a very strong intention that his crop would be missed. 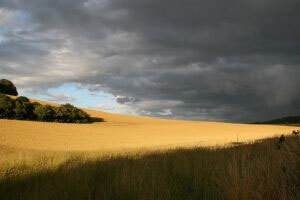 But latter he realized that as he watched the storm turn and follow the fence line that my crop was totally devastated. Wow with neighbors like that…. He is one of the grandest guys I have ever known and what a powerful knowing he had about intention and changing what might seem like impossible chances to change the weather. But I truly intend that those that understand collective conscious and the use of intention see the future weather to be perfect for man to live on the planet. That we have an energy source that maintains a free society and a culture that inspires spiritual growth. Hold clear intention that prosperity comes to you, your family, your neighborhood, your nation and your world. And see our planet transition into a new energy source that is beneficial to every one and everything.